What is a WDS Bridge? Wireless Distribution System (WDS) works by pairing two or more wireless routers. Each router retains the MAC address of other router. When you establish a WDS link between two routers, they associate with each other using the same wireless SSID and channel. One benefit of WDS is that your wireless clients can roam around and connect to whichever Access Point has the strongest signal. Another benefit of WDS is that it creates a true transparent bridge network, compatible with all protocols. A WDS bridge works much differently than a wireless client bridge, wherein the client router connects to the host router using the wireless SSID. 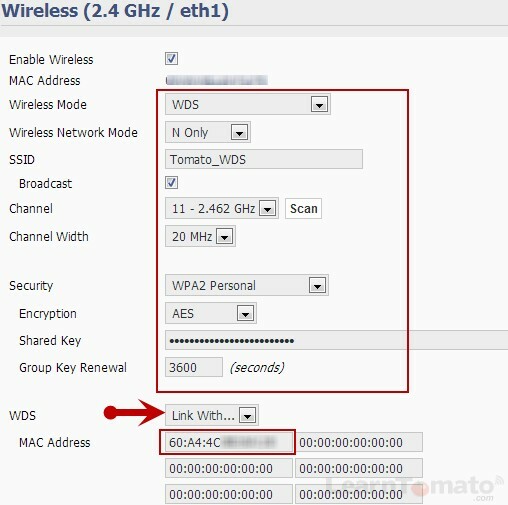 WDS works by placing the MAC address of each peer, on the other peer. Is this a Wireless Repeater? Technically speaking, there are two types of WDS modes, ‘Wireless Bridge‘ and ‘Wireless Repeater‘. A WDS bridge is designed to communicate only with other Access Points and does not allow for other wireless clients to access them. In this case, there is only one wireless link (the link between the two access points). In this case, client computers connect to the routers with an Ethernet cable. In order to repeat the signal to wireless clients, you’ll want a router with dual radio transmitters. When using more than two routers, the key is to make sure there is only one WDS link or “path” back to the primary router. This is very simple, but also very important! Allow me to explain: In the illustration above, Router A will contain the MAC addresses of routers B and D. Likewise, router C will contain the MAC address for router B. 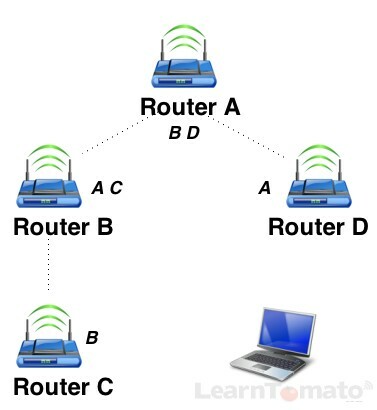 If router C contained a link back to router B and D, then there would be two paths back to the primary router. This hierarchy, although very convenient for spanning large areas, does have an impact on performance. In this case, if the laptop connects wirelessly to router D, it will experience a 50% reduction in Internet speed. If it connects to router C, Internet speed could be decreased to just 25%. This is because there are two wireless links (“hops”), and each “hop” can reduce speed by up to 50%. What about a Repeater Bridge? One way to decrease the impact on wireless clients is to use dual-band routers featuring both 2.4 and 5GHz bands. In the image below, one transmitter on each router is dedicated to the ‘WDS mode’, and the other radio transmitter rebroadcasts the signal using ‘Access Point’ mode. You could use the 5GHz band for your WDS link, and use the 2.4 band in Access Point mode to serve your wireless clients. For now, let’s establish a basic wireless bridge network between two routers. We’ll setup a wireless repeater bridge later. For now, we just want to get the two routers “to talk”. I’ll assume that you are using the same make and model hardware with the same firmware installed on both routers. 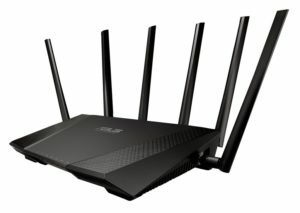 In may case, I’m using two ASUS RT-N66U wireless-N routers. Each router has been flashed with a Tomato mod, built by ‘Shibby’. Set the IP address to say 192.168.1.1. Enable DHCP and assign an IP address range of say, 192.168.100~149. Then, scroll down to the Wireless area. For this example, we will configure the 2.4Ghz band in WDS mode. Wireless Network Mode = G Only, N Only, etc. SSID = Enter a wireless SSID for this WDS link. Channel = Select a channel, preferably channel 1, 6, or 11. Leave the channel width at 20MHz. Shared Key = Enter a strong wireless key. WDS = be sure that ‘Link With’ is selected. 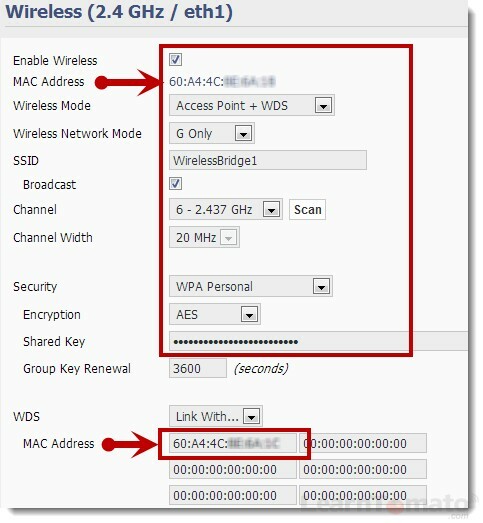 Next to ‘Mac Address’ enter the wireless MAC address of your secondary (client) router. Click ‘Save’ to save the changes. The router will restart. Under the WAN section, ensure that DHCP is disabled. Under the LAN section, assign a static IP address in the same subnet as your primary (host) router. So, if your host router has an IP address of 192.168.1.1, you might assign your client router an IP of say 192.168.1.2. Ensure that your LAN DHCP is disabled. 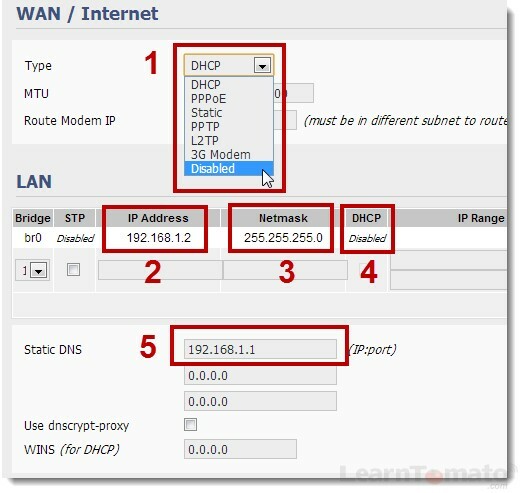 DHCP is not necessary because the host router will handle IP addresses for the entire network. Scroll down to the wireless section and enter the exact same settings that you entered on the host router. The SSID, channel, security type and password must match the settings on the host router. The only difference is that next to ‘WDS,’ this time you’ll enter the MAC address of the host router. TIP: If you are unable to establish a WDS link between the two routers, try temporarily disabling encryption on both routers. If you are still unable to establish a link, double check that you have correctly entered the MAC address of each router, on the other router. Some people prefer DD-WRT firmware for its “Repeater Bridge” feature which handles both wired and wireless clients. As of this writing, Tomato firmware does not offer a “repeater” mode. However it does offer a mode called ‘Access Point + WDS’. In this mode, one wireless transmitter will facilitate both a wireless access point, and a WDS bridge link. TIP: Since you are working with two routers, remember to be careful when logging in and out of each router. It’s best if you connect directly to the router that you are working with (using an Ethernet cable) and completely power off and unplug the other device to avoid changing settings on the wrong device. Under WAN / Internet, set the type to “Disabled”. Assign a static IP address in the same subnet as your primary router. For example; if your primary router’s IP address is 192.168.1.1, set this to 192.168.1.2. Make sure DHCP is ‘disabled’. There is no need to include a DHCP IP range because the primary router will handle the IP addresses. For “Static DNS,” Enter the IP of your primary router (i.e., 192.168.1.1). SSID = The Wireless SSID of your primary router. Channel = The channel of your primary router (1, 6, 11, etc). Shared Key = Enter the wireless key from the security settings on your primary router. And finally, next to ‘Mac Address’ enter the wireless MAC address of your primary router. In order to prevent a mistake, power down the router and disconnect the cables. Now, connect the cables and power on the primary router. Doing this will help ensure that you’re not entering the settings on the wrong router. 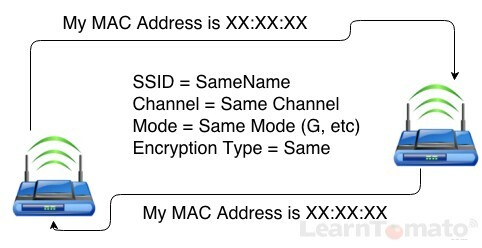 Next to ‘Mac Address’ enter the wireless MAC address of your secondary router. You’re now ready to test your AP + WDS link. I recommend rebooting your primary router first. Wait a few minutes and then power up your client router. Whether the second router is upstairs, downstairs, or across the street, put your laptop or other wireless device near the secondary router. You should notice a substantial increase in wireless coverage. 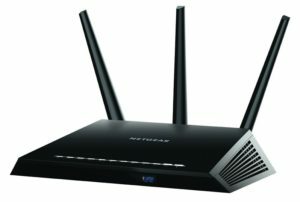 Since the wireless SSID is the same on both routers, your client computers can more easily “roam” around. 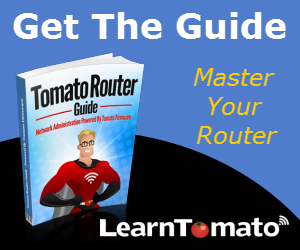 Now, when you connect to your wireless network, the primary router will assign a dynamic IP address to your client computer, even though you may be connected to the network via the secondary router. The secondary router is merely extending coverage.